I recently restored a little German parlour that I unfortunately don’t know anything about. The only info the seller gave me was that it was made in Vogtland in perhaps the 1920-30’s. 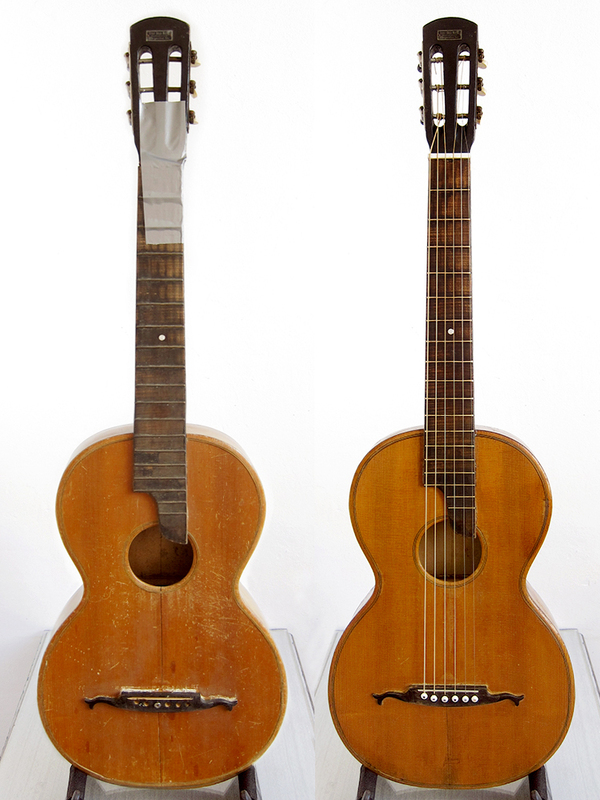 If this would have been a Japanese acoustic or a Levin I would have had a bit more of knowledge but I really don’t know anything about old German parlours. I just bought it to practice my guitar repairing skills and for that it was pretty good, I’ve learned a couple of new things. The idea was to give it to my wife but now we found another one for her so if anyone is interested in buying this then send me an email. The action is a bit high so it’s ideal for slide playing but you can still play it like a normal guitar if you have light gauged strings on it. It sounds pretty awesome, really clear and loud for being so small. It’s made of all solid woods, spruce top, walnut back and sides and perhaps pine or some other light coloured wood in the neck, I’m not that great at guessing woods. One set of machine heads looks original and seems to be from 1920-30’s and the other is perhaps DDR made from the 1960’s, but both works fine. 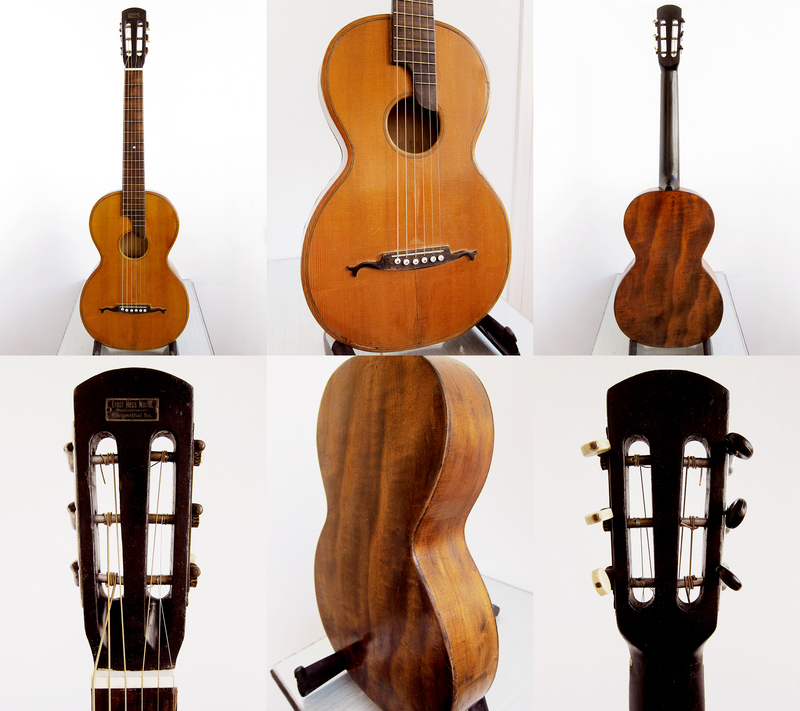 Overall a pretty nice sounding little guitar with a beautiful patina and the most awesome looking one piece walnut back. I started with taking the back off so I could re-glue all the braces. It was pretty straight forward to open it, I used a heated spatula and a knife, it worked like charm, I removed all the braces in the same way. The head was broken and pretty much everything that could be lose was lose on it when it arrived. It has a small makers mark under the bridge but I can’t really figure out what it says, if anyone has any ideas please get in touch. 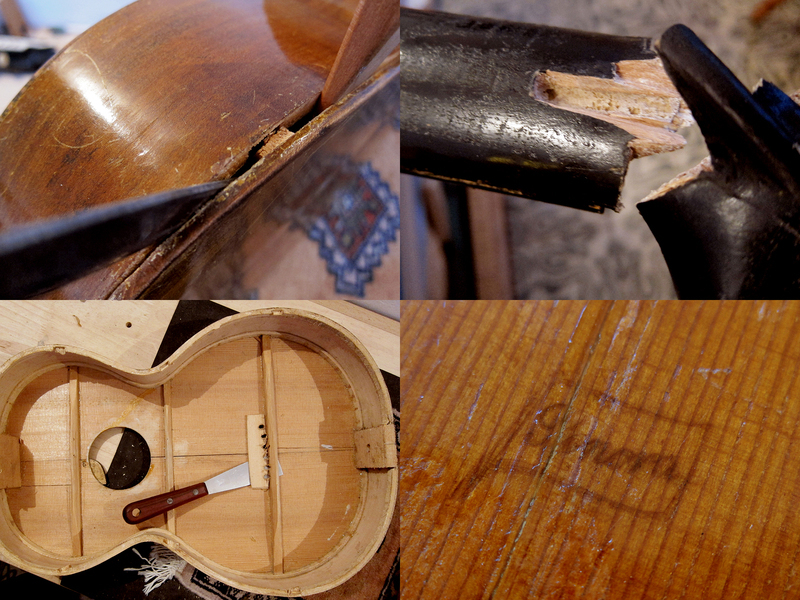 I re-glued all the braces and the two cracks in the top with fish glue. Unfortunately the top had been cracked for so long so I couldn’t get it to close perfectly but at least now it’s solid with two cleats running along the cracks. The next step was to glue the head back on. 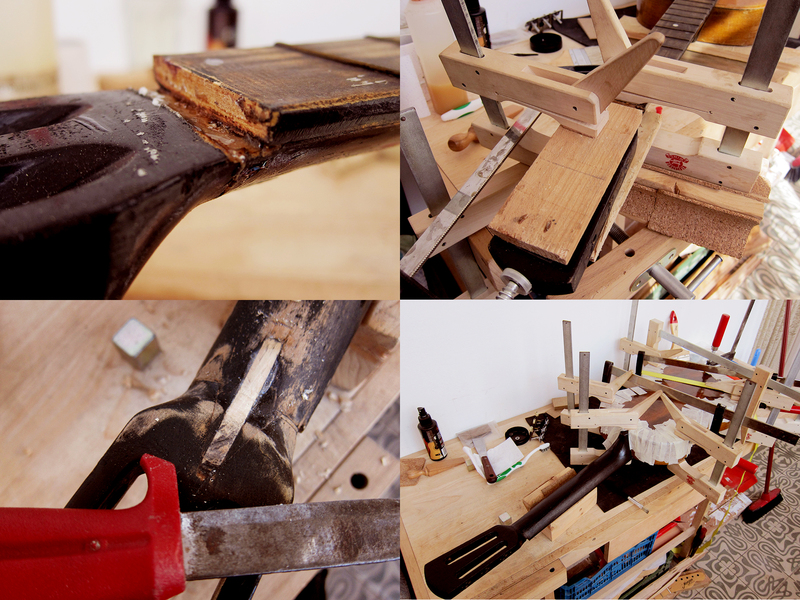 This was a bit harder than the Spanish guitar I glued the head on the week before since the break this time was just under the nut and therefore a lot harder to clamp. I left it for 48 hours and it seems to have worked pretty well so I carved and sanded the back smooth and then painted it black again. I glued the back on and closed the guitar with tape and clamps and this was pretty tricky too, as I’m sure everyone that has ever closed a guitar would know. 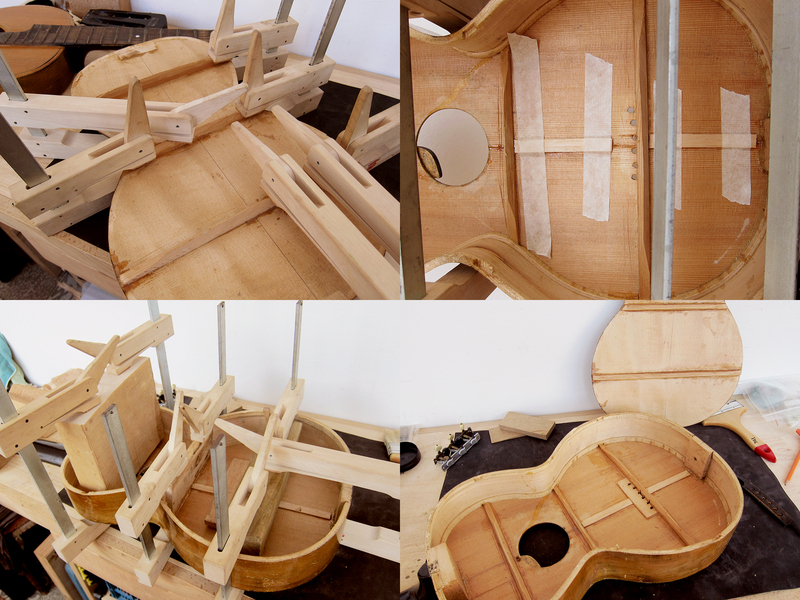 The sides tend to move outwards so you have to push them in place sideways at the same time as you clamp the top down to the body. A bit fiddly but it worked fine in the end. Now I just had to make the guitar playable. These old parlours are known for having banana necks since they lack any form of reinforcement in the neck. On top of that they tend to have a hump where the fretboard meets the body. First I heated and steamed the neck under pressure which worked quite well for straighten it out a bit. Then I took out the last 5 frets, sanded down the fretboard, put the frets back and lowered them as much as I could. I painted the fretboard brown and sanded over it to match the rest. After that it was just to level, crown and polish the rest of the frets.